Get your Helicopter Ball Drop Ticket (until August 15)! Helicopter ball drop tickets on sale July 31 through to August 15 at all Sobeys and participating Foodland and Co-op stores in Newfoundland! You could win a trip for 2 to any Air Canada destination in North America! Tickets are just $2 each. Thank you to management and staff at Sobeys and participating Foodland and Co-op stores, Universal Helicopters, Bally Haly Golf and Country Club and Air Canada Foundation for supporting children’s health care in Newfoundland and Labrador. 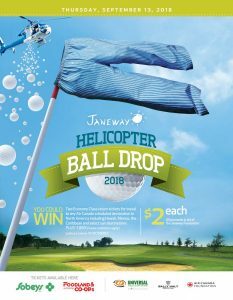 The 15th Annual Helicopter Ball Drop happens Bally Haly Golf Course on September 13, 2018.